Made of the charming and unique Monemvassia grape. while it retains its varietal aromas. Aging: One Year in oak barrels. Served: Cool at 8-10° C, as a dessert wine. 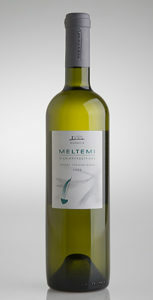 Unique blend of two ancient varieties, the deep reed Mandilaria and the aromatic white Monemvassia. Meticulously handpicked between 10-15th September from the oldest, low yield (5000 kgs/hectare) vineyards of Moraitis Winery Producer Group. 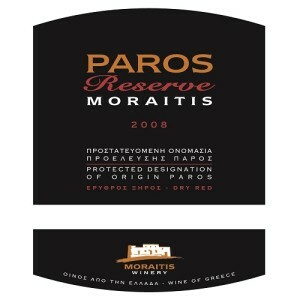 The co-fermentation of the two varieties reveals the quality characteristics of Paros terroir. – Bright ruby colour with vivid garnet reflections. – Chocolate – covered black cherry and kirsch flavors with notes of candied plum and vanilla. – On the palate it has a rich, smooth and round feel with a peppery aftertaste. Aging: 2 years in oak barrels. – Aging in the bottle for 1 year. – Ideal for long aging in the bottle. Accompanies: Grilled red meat, game and spicy cheese. From the richly endowed Malagousia that grows in the private vineyard of Moraitis Winery at Ysterni, we produce this fruity wine which reveals the typical characteristics of Paros terroir. We harvest at the first week of August and the yield doesn’t exceed 8000 kgr/hectare. – Pale white yellow colour with green reflections. – Rich in citrus and exotic fruit aromas. – On the palate it is balanced, fruity, with notes of lemon peel and grapefruit. Accompanies: White sauce, smoked salmon and pasta. Served: At 8 – 10 °C. 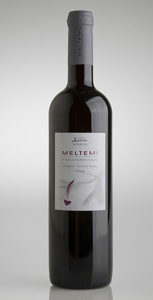 From the private organic vineyards of Moraitis Winery, made of the varieties Aidani Mavro and Cabernet Sauvignon, cultivated always with care and under the supervision of Manolis Moraitis.The vineyards are integrated in a biological culture programme since 1997 and controlled by the certification organization DIO. – Crimson colour with red reflections. – Well structured complex bouquet of ripe fruit, prunes and cinnamon. 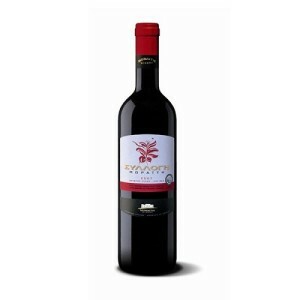 – Complex mouth with a fruity taste, excellently structured with a rich body, velvet tannins and a rich long aftertaste. Accompanies: Poultry, ripened or roasted meat and soft cheese. Served: At 16 – 18 °C. 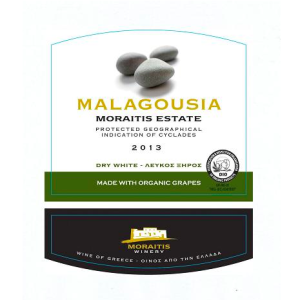 From the private organic vines of Moraitis Winery, made of the varieties Malagousia and Assyrtiko, cultivated always with care and under the supervision of Manolis Moraitis. The vineyard is integrated in a biological culture programme since 1997 and controlled by the certification organization DIO. – Bright pale yellow colour with vivid green reflections. – Fresh flower and grapefruit aromas. 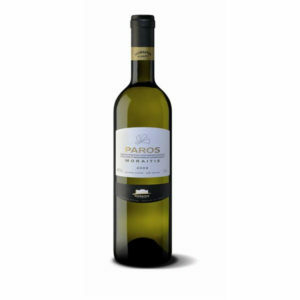 – It is harmonious, mineral with a refreshing acidity and a long lasting aromatic aftertaste. Accompanies: Fish, seafood, oysters, pasta and salads. Fine wine with citrus fruit and flower aromas, balanced taste and refreshing acidity, from Aegean Sea grapes of Savvatiano and Monemvassia, vinified by the Moraitis family in Paros Island. Accompanies: Fish, seafood, white meat and salads. Served: Cool at 8 – 10 °C. 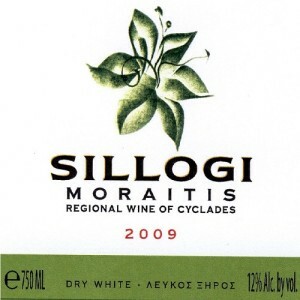 Fine wine with red fruit aromas, balanced taste and refreshing acidity, from Aegean Sea grapes of Mandilaria, Savvatiano and Monemvassia, vinified by the Moraitis family in Paros Island. Accompanies: Pasta, as well as most Mediterranean cuisine dishes. Fine wine with red fruit aromas, balanced taste and full body, from Aegean Sea grapes of Mandilaria and Aidani Mavro, vinified by the Moraitis family in Paros Island. Accompanies: Ripened meat, hard cheese, poultry and red meat. – Green apple and pineapple aromas. – Vibrant and mineral on the palate, with a long aromatic aftertaste.